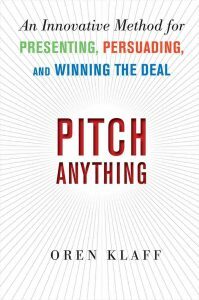 Pitch Anything is a book by Oren Klaff on how to raise money and sell your ideas. And it’s really great. The author goes into details on what a frame is, but as a website on social skills, frame is basically an umbrella word for who’s got the power in the interaction (also read: social mastery). You could say that most articles you read here are about frames. And the main idea Ofer wants to convey is that when you pitch investor you want to do it from a position of strength. That means: make yourself the prize, and they the commodity (money is a commodity after all). In every interaction there’s one party who has the stronger frame, and the stronger frame ends up absorbing the weaker frames and controlling the social interactions. And usually, the author righteously says, when you find yourself in the position to respond (ineffectively) to what the other is saying, you have the weaker frame. And when you need to explain your authority, you rarely hold the stronger frame. Oren says that defiance and humor are the keys to seizing the frame. It’s key not to be confrontational because otherwise you will trigger their flight or fight response, and you don’t want that. The moment you can be defiant without being abrasive, that’s when they understand they’re dealing with a pro. Ofer recommends you approach with a “playful” mindset. Imagine it’s a game which you are enjoying. When Pitch Anything introduced time frames, I had to smile: That’s basically The Power Moves! And right there and then, you handed him all the power. Now he’s the guy feeding you crumbs and you’re kissing up to him, happy for receiving scraps. When you break his controlling frame like that, he will respect you more and listen to you properly. Similarly, if they send in a subordinate saying that the big shot can’t make it, don’t try to pitch the subordinate. Tell him you can give Mr. big shot 15 minutes to be there or you can call it a day. And of course, the oldest trick of them all is making you wait. When investors or potential buyers are drilling you down on financials, they are reinforcing their power frame. They are the choosers. Instead Oren suggests that you quickly answer the financial parts, but then revert back to the relationship question. See? With that frame, you become the chooser! Revenue is X, expenses are Y, the net is Z. The numbers and details you can verify later and take all the time you need. But first I want to find out if we are a good fit to work together. This is what I came here to do. Ofer recommends that if they want to change the agenda, time you’ve scheduled or the people who will attend, you should refuse and withdraw. My Note: I could partially agree with the time. Albeit I wouldn’t cancel but simply make it a bit harder for them to reschedule. I don’t personally see any issue though with changing the people who attend. If you want money because you believe in your project you shouldn’t get hang up on the details of the attendees. When investors meet you, it’s because there’s something in your product or presentation that piqued their interest. You know something they don’t, and that gives you power. During the presentation, they will be asking themselves if they have seen it before and fully understand it, and the moment they realize they do, you lose a lot of power and you lose their interest. What’s the answer then? Don’t let them feel they understand it at all! Status closely interrelates with frames. The person with the highest status is most likely to hold the most powerful frame. Ofer says your pitch shouldn’t be longer than 20 minutes. After 20 minutes people disconnect and start forgetting what they’ve already learned. First of all, reassure them it will be brief. 20 minutes only, a few questions and then you gotta go. It puts them at ease, raises your status and increases their focus. 5 minutes, a key few facts about you and the major accomplishments. It’s important that you show how your idea is not coming out of a lone genius mind, but it’s the natural evolution of market forces and demand. Do name competitors: it shows you are grounded in business reality. And add some time pressure: this is the moment to strike before those competitors wake up. Every investor knows you will be conservative about your expenses and overly optimistic in your growth predictions. Don’t dwell too much on growth then but show you’re good at budgeting: that’s a rare and prized skill. And then introduce what you do better than anyone else, that something that gives you an edge over the competition and will allow you to keep market share even when competitors jump in. And last but not least: make sure they understand one of the biggest assets on the table is you. Tell them what they will get when they will do business with you. I particularly liked the idea of push and pull. Ofer says that when you only pull (hard sell) people will get suspicious. You should float the idea of not giving them the deal (taking it away) and then giving it back to them. It might not work out between us (push). But then again, if it does, we could really do something great together. Hot cognition happens when you decide you like something even before you fully understand it. And that’s what usually happens: we don’t make decisions with rational cognitive processes but with emotional ones. And then we use the data to justify those decisions. You have one of the best deals available but you are choosy as who you work with. Yes you might work with them, but you need to know more: let them tell you about themselves. Ofer explains there’s a scarcity hot button in our brain (also read Influence by Cialdini). And your pitch should make that button itch by putting some time pressure on the deal. I was surprised to see Ofer introduce Taoism here, but it does fit very well. Basically he says that neediness is a huge deal killer. The more you can reach a mindset that you want nothing from others, the easier business deals will get. Don’t let them solve the puzzle! When you’re pitching don’t make your product too simple too grasp too soon or they will lose attention. Keep something that will keep them on edge through the whole presentation. Don’t unload all the numbers right away: structure your pitch to appeal to emotions. Don’t let them drill you down on the details and financials or they get all the power. Remember your frame: you’re there to assess them. If you’ve been too needy or accommodating all your life, you need to focus on power dynamics not to be a victim (also read: why to do good you need to be bad). But at the same time, Pitch Anything sometime feels it’s too much about power struggles (read my blue font comment). And while that is very important, you should not lose sight of the other main aspect: be so good they can’t ignore you. In writing Pitch Anything Ofer mixes psychology, great understanding of social dynamics and a long experience in deal negotiation. However in my opinion he is too hellbent in “getting the power”. And that’s very off-putting to people. I see a lot of overlap between Pitch Anything and this website in the way that it’s all about power moves and the dark side of social skills. However, this website wants people to learn those tricks to stand up for themselves. Pitch Anything is all about getting that VC deal. But overall, I enjoyed Pitch Anything and I couldn’t recommend it more.